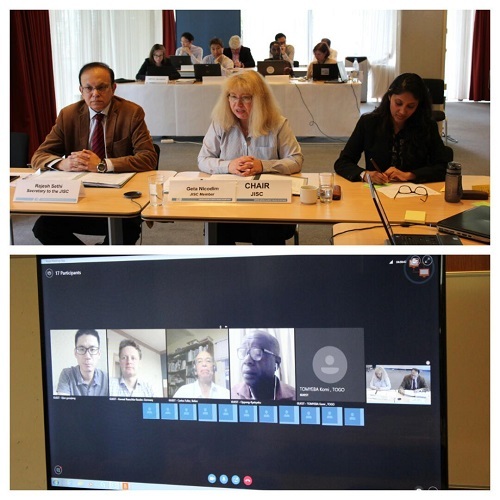 19 June 2018 – The Joint Implementation Supervisory Committee (JISC) held its forty-first meeting, for the first time, in a virtual environment. Prior to the meeting, members voted electronically Ms. Ghergita Nicodim, Counselor at the Ministry of Environment and National Focal Point, Romania, as Chair and Mr. Kyekyeku Oppong Boadi, National Focal Point, Ghana, as Vice-Chair. Both will serve in their executive capacities until the first meeting of the JISC in 2019. The JISC has been utilizing cost-effective tools such as electronic consultation, electronic decision-making and virtual participation in meetings. To further reduce its operational costs, in 2016, the JISC forwarded recommendations to the CMP to allow virtual meetings to be considered as meetings of the JISC. On 19 June, this decision was successfully applied in practice. As part of its two year Management Plan, the JISC last year agreed on two primary objectives: to maintain operational capacity for JI as needed and promote lessons learnt from the mechanism. In line with these objectives, at its forty-first meeting, the JISC decided to continue allowing DOEs accredited under the CDM to act voluntarily as AIEs to perform determinations and verifications. The JISC noted that as on date eleven DOEs have submitted self-declarations, expressing their interest to act voluntarily as AIEs. Through the JI mechanism, a country with an emission reduction/limitation commitment under the Kyoto Protocol may take part in an emission reduction (or emission removal) project in any other country with a commitment under the Protocol, and count the resulting emission reduction/removal towards meeting its Kyoto target. JI projects earn emission reduction units (ERUs), each equivalent to one tonne of CO2. ERUs are created through the conversion of an equivalent number of a country’s assigned amount units. All emission reductions must be real, measurable, verifiable and additional to what would have occurred without the project. The second commitment period of the Protocol has yet to come into force. Thus, JI currently suffers from lack of demand.